The Worlds first High Definition HD Helmet Cam! Introducing the ContourHD! The ContourHD camera records HD quality audio and video and can accept up to a 16GB Micro SD Card! ContourHD combines amazing video clarity (choose between High Definition or High Action), a wide angle lens (135 degrees), single button simplicity, and a click to share online experience. ContourHD can switch between crisp HD quality video captured at 30 frames per second or butter smooth SD quality video captured at 60 frames per second. Its all-in-one design means ContourHD has no wires or a separate recorder, but instead captures up to 8 hours of HD video to its own internal micro SD memory card (compatible with up to a 16GB card). 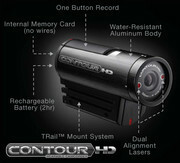 Armored with an aluminum body and two lasers for quick alignment, ContourHD is ready for any weather or adventure sport. Its light (4 ounces) but armored aluminum body enables you to capture video in any weather conditions. ContourHD’s TRailTM Mounts seamlessly attach the camera to your body, helmet, goggles, or vehicle for hands-free recording. Choose between High Definition mode or High Action mode! ContourHD’s operation couldn’t be simpler, as it features a single oversized record switch that you can use even when you’re wearing a pair of gloves. Slide the switch forward to record and slide it back to stop—congratulations, you just made a video! Now you can capture the best scenes right before they happen. Have you ever seen a camera with lasers? 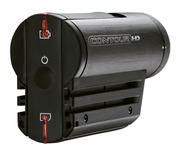 ContourHD uses two of them and a 192o rotating lens to ensure you line up the shot every time. Turn on the lasers and rotate the front lens until the two laser points are horizontally aligned. Congratulations, you just lined up your video.